What would your local high street look like if it was designed by Prince Charles? The plans for one English city show how the prince's building theories could be put into practice. City centres should be showcases of civic pride - but all too often they're civic embarrassments. During the day, they're anonymous shopping zones, at night they're hunting grounds for teenage drinkers. Instead of being places for people to wander, too many city centres are cut up by aggressive road schemes - with local character disappearing under sprawling retail units and corporate blandness. But how can city centres be improved? The Prince's Foundation for the Built Environment, set up by the Prince of Wales to promote traditional building design, has been asked by Lincoln City Council to produce a 30-year blueprint for urban regeneration. This plan for a "sustainable city" sets out 20 separate building projects which collectively are intended to "reconnect fragmented areas of the city and create vibrant, enduring streets and public spaces". "Making city centres work is not about mega-projects or iconic buildings or branding consultants," says the foundation's chief executive, Hank Dittmar. It's about a simpler, more organic version of town planning, he says, such as more routes for pedestrians, better public transport and more attractive public areas. It will also mean trying to develop a design style with a clearer local identity - and overcoming the mistakes of the past, such as the obstacle courses created by putting major roads through the middle of cities. "For the past 40 years or so, cities have been seen as machines for moving around people, usually in cars," says Hank Dittmar, who is a former adviser to President Clinton. He wants to reverse the trend - and wants to get rid of the "typical, inward-facing 1960s shopping blocks, with very tired buildings", which he says are built without any reference to the individual identity or location of cities. Public spaces have to be changed so that "people can go out at night without being scared", which he says means getting rid of abandoned, unpopulated concrete spaces - and to look at the dimensions that make people feel most comfortable. The proposals, which are now open to public consultation, promise a more integrated city, linking up the historic cathedral area, the university and city centre - and creating mixed-use areas for retail, leisure and work. "We want a city that reflects its own DNA", says the foundation's Kathy Haslar, rather than a "clone town". "Cities have their own strong bones to build on, they don't need to look for some other 'brand'. They can use the materials at hand - the stone, the brick, the people - to convey local identity," says Mr Dittmar. 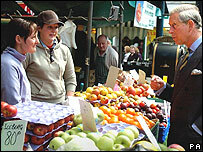 Prince Charles's calls for traditional urban design were once mocked as unfashionable and a form of pastiche - the architectural equivalent of a Georgian facade on a fridge freezer. But Mr Dittmar says that even if the prince's views remain unpopular with many architects, his scepticism about modern building styles has struck a chord with the public. And Lincoln's commitment to the Prince's Foundation plan shows how much his ideas are now entering the mainstream - with the council confident that there is sufficient public support and private funding available to implement the project. Kate Mear, the council's project manager for the regeneration scheme, says that the debate about traditional versus modern architecture is no longer relevant. "It's not about making Lincoln Georgian," she says. Both modern and traditional styles can work together, as long as they are part of a coherent, considered, bigger picture. "There have been two fundamental planning mistakes in the past 40 or 50 years - to see individual buildings in isolation, how they work internally rather than their wider impact, and to allow the car to dominate everything." And she believes that the proposals for Lincoln mark a turning point that will give the city back to its inhabitants and put it in reach of those living in its hinterland. But will such cities ever really be able to create the type of relaxed, pedestrianised, family-friendly public spaces common across Europe? Will there be elegant piazzas rather than intimidating, windblown expanses? Ms Mear is confident that this is possible - and that English cities are not doomed to equate public spaces with binge drinking and threatening behaviour. As an example, a car park near to the train station is going to be re-invented as a square, which she wants to see filled with cafes, shops and people - with restricted access to traffic, in the style of continental squares. And she believes that improving the public environment can help to improve public behaviour in such settings. 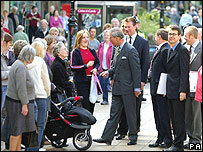 The renewal of Lincoln will be the latest stage in Prince Charles's design ideas being turned into bricks and mortar. The village of Poundbury in Dorset, built in keeping with the prince's design principles, is now a sufficiently mature community for the local paper to be reporting stories about planning disputes, crackdowns on anti-social youths and debates about CCTV systems. And there are plans for an even bigger development near to Plymouth in Devon, which if it gets the go ahead, will provide another example of Prince Charles's architectural values. So is he winning the argument? Speaking in New Zealand in March, Prince Charles said there was a "groundswell" of support for the ideas he has been espousing for the past two decades. People in towns and cities "instinctively understand that we need to learn again how to make walk-able, liveable, well-mannered, beautiful, places", where it "doesn't take two litres of petrol to drive to buy one litre of milk". But piazzas in the Lincoln sunshine? We'll have to wait and see. Brilliant! About time someone listened to him on this one. What a cheek - just visit Poundbury to see a Disneyland hotchpotch of misplaced buildings that is despoiling the countryside of Dorset for the sole advantage of the Prince's pocket. We know Charles is looking for a job, but architect to the people? Please NO! I would definitely like to see more pedestrianised city centres. Park and ride systems, or even trams, would make the areas far more attractive places to be. Cars are not necessary except for trips to out of town supermarkets and so they should be allowed. The transport and layout of a town are far more important than its buildings. The appearance of many town centres is pretty grim but your article alludes to the bigger problem - that too many people are afraid to enter them once the stores close because of the threatening behaviour of drunken youths. Town planning may possibly move those problems elsewhere but our towns will not really improve until we manage to overcome this depressing aspect of UK society. We looked to rent a house in Poundbury just over a year ago. When I asked why the large bathroom window didn't have frosted glass, the estate agent replied that it was because Prince Charles didn't like frosted glass so the new houses didn't have it. Which is fine if you are in the middle of a country estate with no neighbours but not so good if they only live 10 yards away! I agree that our towns need to change and welcome a more sustainable outlook for our cities, but architecture and design move on. In this country we are obsessed with low quality pastiche. We need to embrace more modern architecture and design not just copy the style of past decades. After 10 years Poundbury is only a few hundred homes. Therefore I am puzzled by those who sing its praises when it has not delivered at town or city scale. The Foundation was also recently criticised for participating in a developer scheme to build a urban extension to Harlow on green belt land before a land allocation had been granted through the planning process. They are now no longer active particpants on the project team. Despite that I believe the Foundation's ideas may have some relevance in regenerating city centres. The Foundation might look to contribute to the newly formed Urban Regeneration Company in Harlow Essex to revitalise the town from within. Regaining Harlow town centre for the residents through radical redesign, incorporating some of the ideas mentioned, would be a worthwhile project. They key must be to engage the communities in dialogue and to understand their needs. I think this is a wonderful idea, the current sites in question are incredibly dingy at the moment. Everything around them has been improved but the sites in question stick out like a sore thumb. I think these plans are great for a town like Lincoln with its incredible history and idyllic appearance. They can only improve on what is already a beatiful town. The best of luck to Prince Charles and his design team. After working in the development industry for twenty years in the south-west, I wholeheartedly endorse his vitality, enthusiasm and vision for future development. Too many towns and cities across the region have been ruined by developers. Developers who have granted considerably more time and attention to the needs of multinationals, car traffic and profit over those of the individual. I agree with making towns more pedestrian friendly more pleasant places to be but please please save us from Prince Charles' backward ideas on architecture. We need more forward thinking, exciting, modern architecture that belongs to this century instead of continually aping old tired styles that belong in the past. Let's have architects design our buildings not developers or town planners. The problem with Wigford Way isn't so much the ugly concrete building, but the fact that all the large buildings are shadowing the path, and Prince Charles' suggestion to replace a two storey concrete building with a four storey brick building, regardless of how attractive it may be, will surely make problems worse. While I don't agree with The POW on many things, I think his ideas on architecure and spatial planning are spot on. Poundbury is a fine Town and has set the standard now followed by many big housing development companies and planning authorities. Hats off to him on this one. What credentials does Charles have apart from sitting on his backside all day. He thinks he can use his position to force people to do what he wants and how he wants whether his ideas are practical or not. Get on with your own job of waving to the crowds and let qualified architects do the job they are paid to do. Although no longer living in Lincolnshire, I know Wigford Way, Water Lane and Much Lane in Lincoln well. I think Prince Charles' vision of how this area of central Lincoln could look is certainly preferable to how it looks now, and is probably better than "modern", so called town planners could produce. Prince Charles has my total support on this. Too many of our cities are caught in a catch-22. The inner-city is neglected because workers need lots of roads for long daily commutes, which people only have to make because 60% of inner-city land is taken up by roads and car parks. The idea is right, but the implementation might not be. I'm not too impressed by Poundbury. I find it a sad (but hardly surprising) reflection on human nature that we ended up letting our town and city centres get into the state they are in. These things don't happen - someone wanted that building there, and designed it, and it had planning permission, presumably with functionality and money in mind, and nothing else. Unimaginative and greedy was the 20th century, attractive but showoffish a lot of the 19th, and modern seems to be brash and charmless, but at least not always dull. I completely agree with Prince Charles' view of the way cities have been "redesigned" in the past 50 years. Arrogant architects designing urban sculptures with no consideration for the human element should be relegated to the dustbin of history. Greedy developers concerned with a quick buck, rather than long term public good add to the degredation of landscapes and cityscapes everwhere. It is high time we put the human element back into urban design and the car out. Finally - design taking into account what people want, rather than just what is required for a place to function. A tiny photo and an even tinier drawing - how on earth can we tell what our towns would look like on the basis of such limited information. Why don't you publish some more pictures and make more of this story. Come on BBC! At last, common sense returns to the built environment. Prince Charles was right, from the moment he first made that "carbuncle" comment about the hiddeous modern extension to the British Library. Architects had forgotten that buildings above all else should be designed for people, and that people like detail and friendliness. Victorian and older buildings are loved because they have character, quirkyness, and style that makes sense to the ordinary person who looks at them and thinks "beautiful" or "impressive", or "fun". Too much "modern" work in the 60s and 70s was inherrently ugly and dehumanising. Whatever Prince Charles did, it couldn't possibly be worse than what the planners here are currently doing. Hear, hear. At last Prince Charles is getting some support and credit for his ideas on architecture. I have always been a supporter of his ideas on this matter, because many towns and cities have lost their character. High streets have given way to shopping malls and they all seem to be all too samey. Too often they have gone for the modern approach and end up looking bland. Let's not forget the ugly structures erected during the 60's and 70's. Family friendly public spaces - what a magic concept for city councils like Birmingham to accept! This means keeping the character of areas in Birmingham such as Birchfields, Lozells and Aston by helping to renovate the ornate Victorian houses not bulldozing them and replacing with concrete ghetto highrise flats and massive road constructions right through the middle of a vibrant community. Prince Charles is to be applauded for his longstanding fight against architect iconoclasts and urban planning morons in city councils. Wake up, people enjoy having their own little garden, walking round the corner to a store and having a chat to neighbours they meet on the way and if there is a space with benches to sit awhile, so much the better. "What is this life if full of care, we have no time to stand and stare." How twee! Why aren't we as adventurous with our houses as we are with our office blocks. Just look at the fabulous London skyline. Doesn't PC realise that new materials are available and we don't live in the 18th century any more. If the Dutch can be adventurous with house design why can't we! The comment that Hank Dittmar aludes to about the Prince's views "remain unpopular with many architects" is the usual tosh we get from Modernist architects. It does not mean that they are unpopular with the majority, non-architect! We need quality, human, organic architecture in our lives. Winston Churchill said we shape our buildings and then they shape us. That may account for many of our social ills! Prince Charles, long after his death, will come to be regarded as a visionary thinker who had the courage to challenge the smug egotism of the architectural establishment. His legacy will be a better human environment. God bless him. I agree wholeheartedly with Prince Charles' ideas about town planning. Save the town's charm and spirit and increase it. There's nothing uglier than modern architectures stuck in the middle of historic buildings. Look at the perfect example of that in London, the Swiss building that looks like a glass suppository. Fine. That's what Prince Charles likes. Not everyone wants buildings to be replicas of old buildings, making the facades look over 100 years old. Change is good. Thank goodness some designers are willing to take a risk and not stick with tradition. Please remember that all architecture was new at one time. Imagine what people must have thought when the Georgian buildings were being erected? I come from Stoke-on-Trent where you can find some of the worst examples of architecture that you can imagine along with a council that is keen to bulldoze the few remaining beautiful ones. Prince Charles is absolutely right and I hope more cities will follow suit. Let's have cities to be proud of and not embarrassed by. He can try to develop Basingstoke. The best of British luck to him...!! Prince Charles is ridiculous. His idea of urban living is something out of Tom Browne's school days and Enid Blyton Books. His idealised environment is for middle class Daily Mail reading white market town dwellers not rooted in this millennium. Charles didn't study architecture or planning at University for 5-7 years and his delusions are telling. 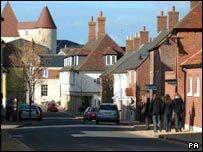 As a Town Planner I find Poundbury a "fetish environment" for those who reject modern living, lifestyles, and design. The sort of people who dream we are all living in 1930s colonial England. Poundbury is a glorified theme park, it's nothing more. At last someone is taking Prince Charles seriously on this matter top marks to Lincoln. I would like to see Liverpool city council do the same. So far thier plans for European city of culture in 2008 have been pretty disastrous. As an inhabitant of Lincoln, I am absolutely delighted that the city has involved the Prince's Foundation for the Built Environment in this way. It's the most encouraging thing that's happened here for a long time. Over the thirty years I have known the city, there has been a great deal of messy, piece-meal and depressingly insensitive development.